I'm on holiday hunting bass, for the 25th year in a row! Every year in late August and early September, me and my old man target the bass, mostly on lures. We have our Orkney 440 boat situated down here, but due to severe storms we were only able to fish from the shore marks that in the past have produced some stonking bass, with specimens to over the magical 10lb mark, so its not always the best option to use the boat. We arrived on the Wednesday evening after a 3 hour drive form Manchester, the weather was quite bad, and we knew we had to leave the boat alone and fish some of the local bass marks from the shore. On the Thursday morning we headed to one of our shore marks, a well known beach for producing big bass. 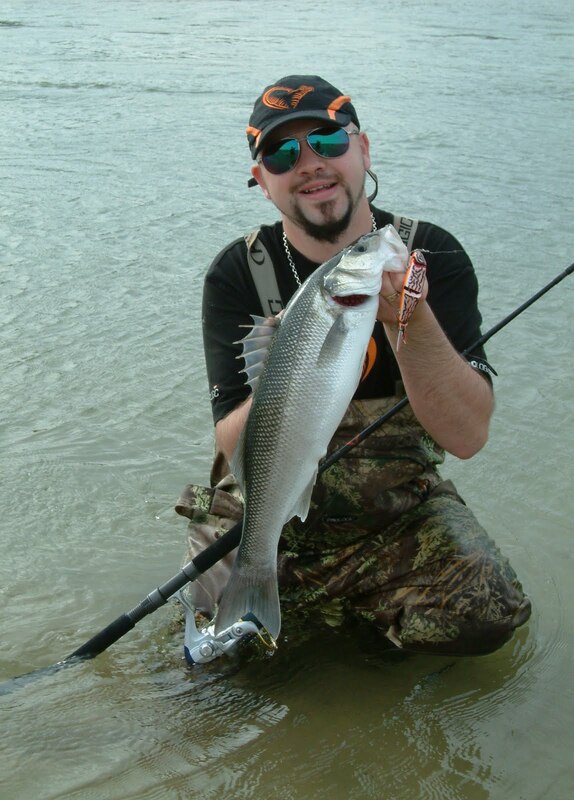 The surf was perfect, if you have never tried plugging for bass in the surf I suggest you try it, its great fun. Bass will hunt in less than 3ft of water and can be under your feet sniffing sand eels out, the 3rd breaker is the most strongest, so that's where all the goodies get churned up, and that's where the bass will feed. Anyway, on my first chuck, with a Savage Gear Prey I smashed a decent bass of around 4lb, then my old man was into a decent bass too. They went crazy, they were smashing sandeels left right and centre, there were heads, tails and scales flying all over the place, they were feeding really hard. 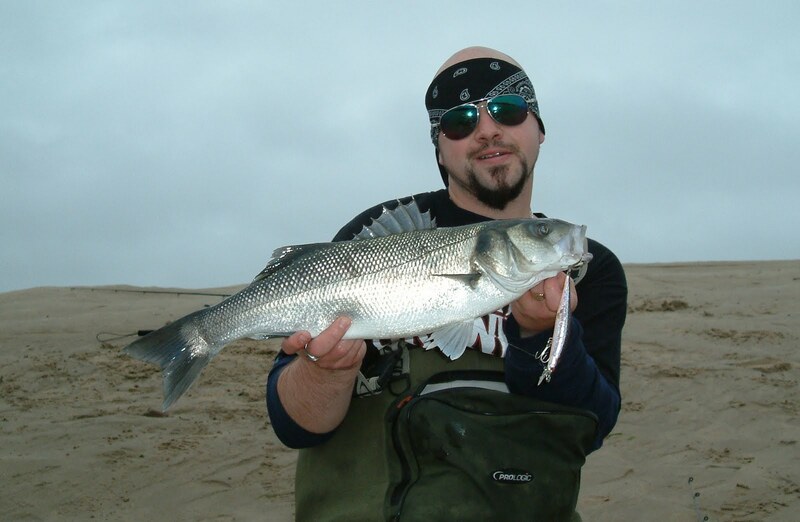 Bass will flank the lure to try and stun it, as they do to prey fish sandeels, white bait etc, Flanking means they use the side of there gill plate to stun the prey, then they turn round and pick the injured fish off. What I tend to do, once I feel a bang on the lure, I leave it suspended for a split second then continue to wind as normal. Also very abnormal winds can put bass on the shore, I tend to wind very fast - faster than I would when pike fishing. We must have hit the tide just right, it was 6pm and I hooked into our 18th bass between us, again another bass of 4lb in fact we never caught a bass under that size. With the session drawing to an end, my dad hit a monster that doubled over his Savage Gear MP rod then pulled free. Then he made another cast in the same area just over the 3rd breaker in the white wash, and BANG, he was in again, it gave him a great battle, a beauty of 7lb 12oz, now that's quite a size from the shore especially on a lure in just 3ft of water. The bass just kept on smashing our lures, our arms were killing us, but what great fun. Over the 2 days we had well over 30 bass, between 4lb and 8lb all catch and release, which I think is important as Bass are very slow growers. I am here for another week so I will keep you all updated! Check out the underwater footage in this teaser video! If you have any questions about lure fishing for bass just contact me through the blog, or even better come and see me at the GAC Open Weekend at the end of September, where I will be in store giving talks and demonstrations on Savage Gear products and my fishing adventures!